Are you tired of collecting and buying fish to stock your tanks from others? Have you ever thought that you might like to take the next step and start breeding your own stock? Are you looking for a small species that is non-aggressive and does not lay eggs? 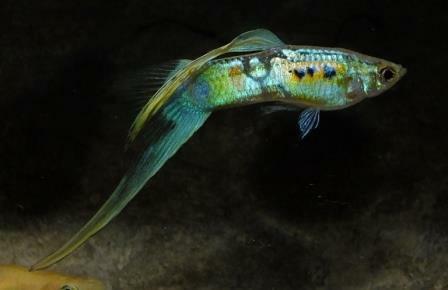 Well, the world of Domestic Guppy Breeding might be the answer for you. The AMAZONAS editors asked me to put together an introduction with a little background information on myself and what my future publications might entail. For the past 30+ years, I have been a member of the International Fancy Guppy Association (IFGA). 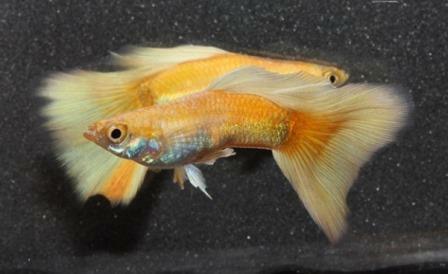 My focus as a Guppy breeder during this time has been almost exclusively devoted to breeding and showing a particular phenotype of Guppy known as Swordtails: Top Swords, Double Swords, and Lower Swords. 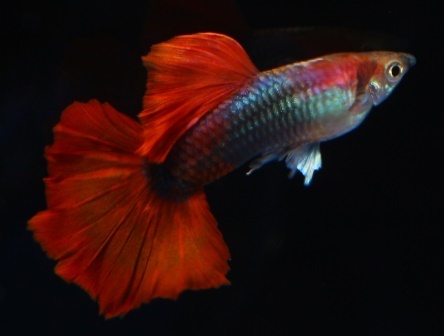 For the past 15+ years, I have been concentrating on re-inventing and improving upon Lower Swords, incorporating traits from others Guppy strains into this once rather bland little phenotype. In the interim, I have utilized systematic breeding tests and cellular-level research to help educate not only myself, but breeders around the world, if they have an interest. For those of you interested in some of my past efforts, you can check out these two links: http://www.swordtailguppies.com/publications.html or http://swordtailguppies.blogspot.com/. 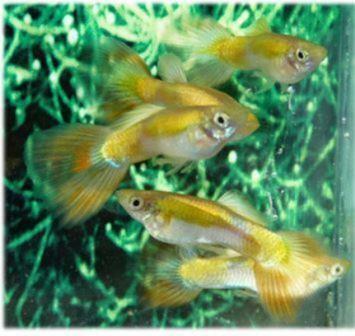 Modern Domestic Guppies are the product of nearly 100 years of selective breeding and accrued breeder knowledge. Much of this is by trial and error, though recently many progressive breeders are taking into account scientific publication and breeder publication. After all, why invent the wheel if it is not needed? If you would just like to experiment a little on your own, that’s what Guppy breeding is all about. 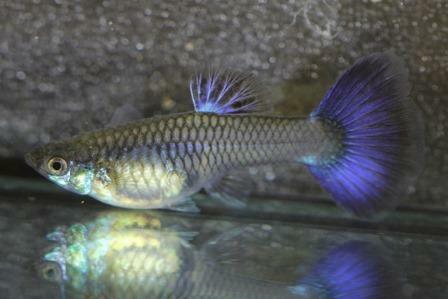 Poecilia reticulata has been the primary source of genotype traditionally found in modern strains of Domestic Guppies. However, over the last several decades, breeders around the world, with Asia in the forefront, have incorporated variant populations of Poecilia reticulata wingei and Poecilia reticulata obscura. By doing this, they have identified a host of new traits for color, pattern, and fin shapes. 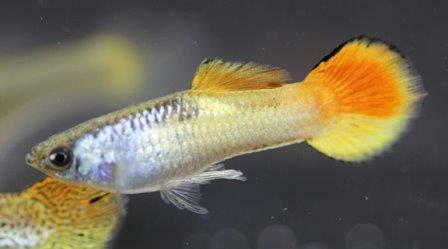 Not all breeders wish to hybridize these variant populations of small-tail guppies. Many have chosen to breed and maintain them in pure form. In the process, a whole new sub-culture of Guppy breeding has arisen. The sheer volume of phenotypical variations for color, pattern, and finnage in Domestic Guppy breeding is immense (far too large for this writing). 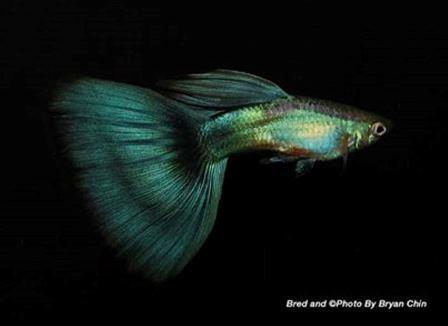 In finnage type alone, there are Swordtails, Delta Tails, Veil Tails, Roundtails, Speartails, Pintails, Merah (Crowntails), Swallow, Halfmoons, Fantails, Flagtails, Lyretails, and Spadetails, to name but a few. There’s something for everyone’s preference and interests. 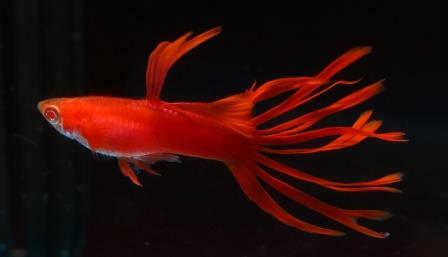 Full Red Crowntail (Merah), photo courtesy of China Guppy Club. A talk about breeding Guppies would not be complete without a little mention of the show circuits and clubs found around the world. 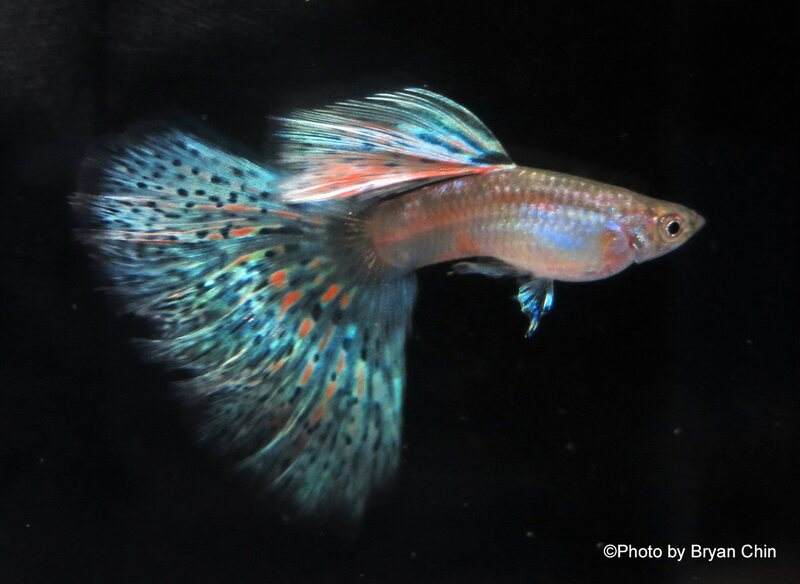 Judging by the number of Facebook pages specifically aimed at breeding Guppies, it is probably safe to say that the “good old days” of Guppy breeding are here in the present. While nothing says you have to show your breeding results, it adds a lot to the hobby, not only in the form of knowledge support, but also in stock sources. The friendships and acquaintances you form can last a lifetime. With modern technology, contact with and responses from breeders are often in real-time. In my youth, these often involved a well-written letter and several months of waiting for a response. 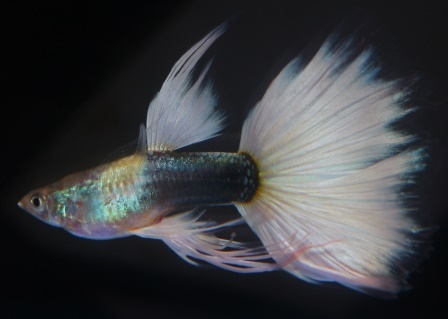 So there you have it, in a nutshell: a little about my interests and a little about the world of modern Guppy Breeding. I will expand upon these areas in future writings. My pieces will deal with breeding, color/pattern phenotypes, finnage phenotypes, genetic study, a bit of husbandry, and a mention of some events hosted by breeder groups around the world. Purple Delta Female, photo courtesy of Hermann Ernst Magoschitz. 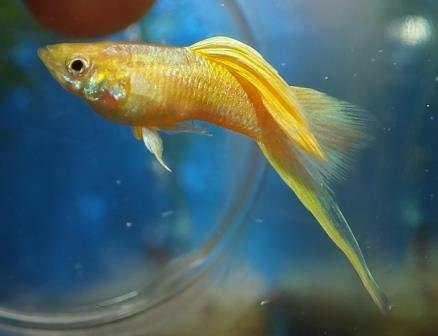 I’d like to mention that this year’s 19th World Guppy Contest (WGC) is being held in Vienna, Austria from August 22-28, 2016 (http://www.worldguppycontest2016.com/). This follows last year’s highly successful 18th WGC, held in Tampa, FL, by the Florida Guppy Club. Held under the auspices of the World Guppy Association (http://www.world-guppy.org/), WGC contests are traditionally rotated around the world each year. I have wanted to attend a show hosted by the Austrian Club, one of the oldest in the world, since a teenager. Now I will attend, and I have been humbled and honored with an invitation to judge the event. This show promises to attract breeders from around the world. There is still time to plan a trip if it is within your means. A little closer to home, this year’s IFGA annual show and awards banquet will be hosted by the Michigan Guppy breeders (http://ifga.org/show_rules/2016/michigan_2016.htm) Sept. 30-Oct. 2, 2016, in Romulus, MI. The IFGA has long been known as a premier source of highly-developed Delta strains world-wide. Michigan not only has one of the most active clubs in the IFGA, it also supports one of the most successful groups of friendly breeders in the country. Get to know them. Think about attending; you will not be treated as a stranger. IFGA Green Delta, photo courtesy of Bryan Chin. 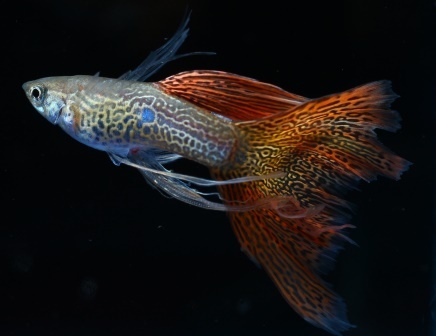 A successful Guppy breeding program can incorporate as few as 8-12 tanks with a single strain. Breeding takes time and patience to produce positive results. You will make mistakes, but we all do. In a world that is increasingly fast-paced, you might find some peace and solace in raising a simple little fish known to many only by the often poor quality and unhealthy stocks found in the local fish store. In closing, here are a few more photos of some modern Guppy strains produced around the world to further pique your interests. 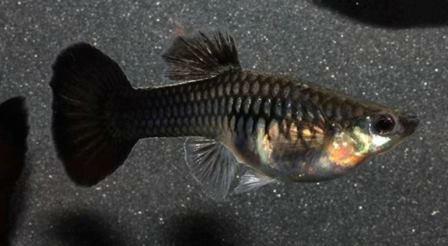 Half Black Red Halfmoon, photo courtesy of China Guppy Club. 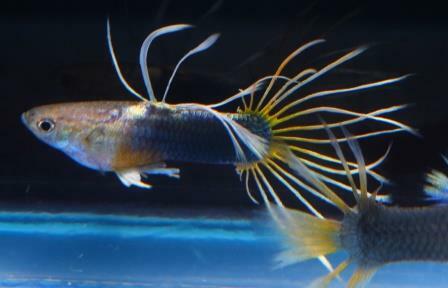 Half Black White Ribbon Fin, photo courtesy of China Guppy Club. Black Moscow Delta female, photo courtesy of Hermann Ernst Magoschitz. Permission granted for nonprofit reproduction or duplication of photos and text in entirety with proper credit for learning purposes only. All photos by author or used with express permission of breeder / photographer. All Slide Show photos by Alan S. Bias, Bryan Chin, Carl Groenewegen, Herman Ernst Magoschitz and Guppy Club China. 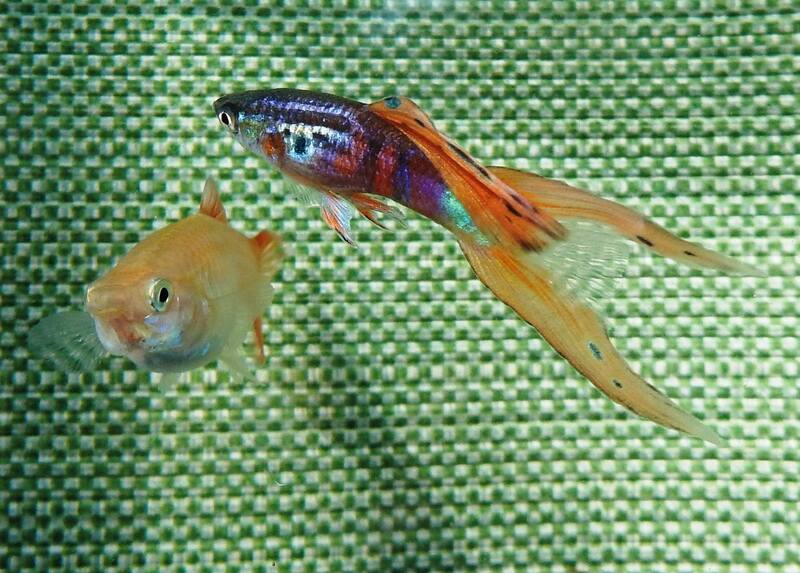 Alan S. Bias is Domestic Guppy breeder & exhibitor of 47 years. 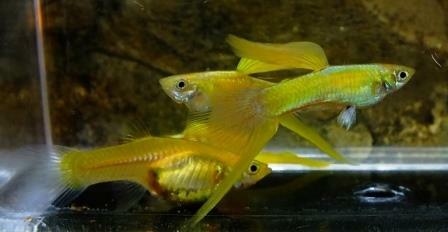 Over the last 30+ years he has specialized in strains known to breeders as "Swordtail Guppies". For nearly 20 years he has done cellular level research, combining formulated breeding tests & systematic observation to help breeders understand the complexities of modern Guppy genetics in the strain being produced. 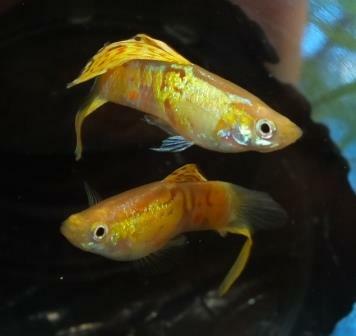 Subject: Aging Research and Guppies, looking for help. Over the last 8 years significant research has been done on the effects of Methylene blue on senescence or aging. It appears to be effective at restoring mitochondrial function in tissue cultures of old cells across species and it has been show to be effective vivo as well. Research articles also demonstrate that is acts against inflammation, and has many profound effects on organ systems. I remember from keeping tropical fish as a teen that methylene blue was used to treat a spectrum of conditions in tropical fish. I cannot find any scientific literature that documents lifespan studies that medicated animals with methylene blue and how it effected there lifespan. 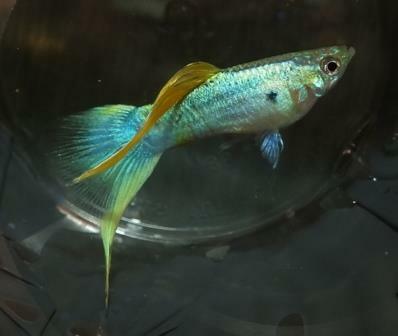 Have you, or do you know of any of your guppy breeder acquaintances that have raised guppies for there entire adult lives with methylene blue in the water? If so what was the result? 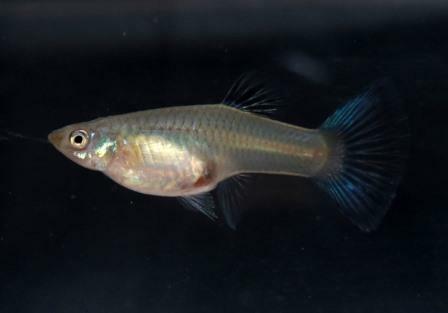 if so, did it effect their life span, did it delay guppy menopause? If these questions do not have answers, due to the very short lifespan of guppies, I am interested in the possibility of enlisting guppy breeders to run these experiments. Here is a link to of the most recent articles on the effects of methylene blue in people.